Following Tuesday’s SmackDown Live and 205 Live tapings, WWE Champion Daniel Bryan defended his title against AJ Styles in a dark match. Bryan wound up retaining his title over “The Phenomenal One” via disqualification. However, after the match, Bryan cut a heel promo on the Alabama crowd. Bryan poked fun at their college football team for losing the National Championship game to Clemson in a blowout. Styles then came back and attacked Bryan before celebrating with a young fan. He then did an impersonation of WWE Hall Of Famer Stone Cold Steve Austin. After the crowd chanted “Hell Yeah” Styles hit Bryan with the elbow. 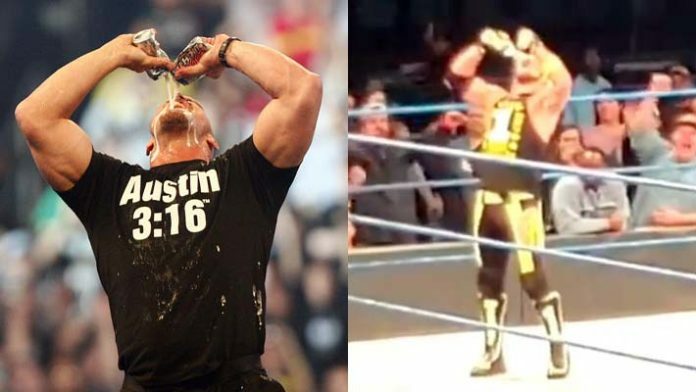 He then mimicked Austin’s beer drinking celebration with water bottles.